2012 is the 30th year Louis Vuitton is sponsoring the LV Cup sailing contest, the winner of which will go on to contest the America’s Cup in San Franciso. 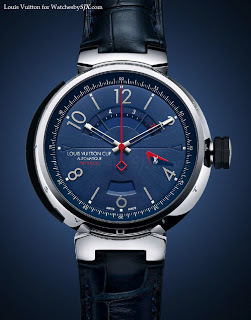 For this event Louis Vuitton has unveiled a new sailing chronograph, the Louis Vuitton Tambour LV Cup Automatic Countdown. Though not a serious, technical timepiece by any means, this watch is attractively designed and executed, like most of the LV watch range. This has a 44 mm steel case with a metallic blue, sunray brushed dial. Inside is an ETA calibre with a Dubois-Depraz module giving it a five minute yachting countdown function with flyback. Although Louis Vuitton is hardly a high horology brand, that is changing. In fact, Louis Vuitton is more ambitious than fellow fashion house Chanel, in terms of technical, rather than mass market watchmaking. Next year Louis Vuitton watches will move to Meyrin in Geneva alongside La Fabrique du Temps, which LVMH acquired in 2011. Fabrique du Temps is the movement specialist responsible for the Laurent Ferrier Galet Micro-Rotor and Grand Prix d’Horlogerie de Geneve-winning Galet Classic Tourbillon, amongst other things. Inspired by the look of 19th century Louis Vuitton aluminium steamer trunks, the LV Fifty Five is heavy on the styling cues of 1980s timepieces, with a sleek, slim case and integrated bracelet. Here's a look at the line-up, with original photos and pricing.